I have recently acquired a pair of Mk VIII goggles to go with my leather flying helmet. They are genuine issue goggles and not reproductions. 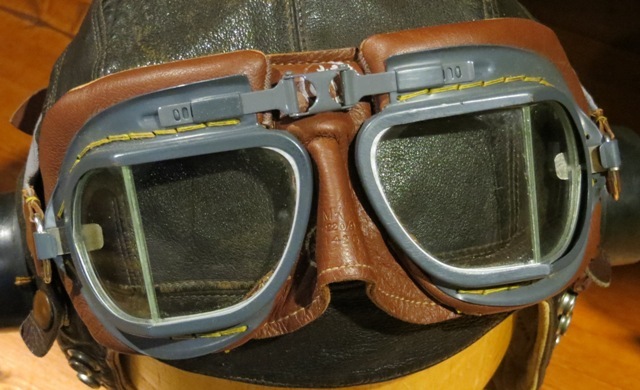 I've tried to research how to tell the difference between wartime manufactured goggles and post war goggles as this model was used for many years after the war. However, I am drawing a blank. Is anyone here familiar with the subtle nuances of wartime and post war goggles? I've noticed that some goggles have black thread holding the padding to the metal frame whereas mine have a tan thread. Perhaps that's an indicator but it might also simply be a manufacturer's variation. Regardless, they are in beautiful condition and came with the issue box. When I first started collecting a number of years ago, my focus was mainly RCAF (and RAF), so I am quite familiar with these. Wartime Mk VIII goggles will have an Air Ministry stamp impressed into the leather above the bridge of the nose. Look closely, as the imprint is often fairly faint.